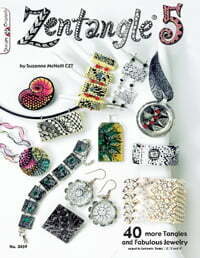 The new Zentangle books are here! 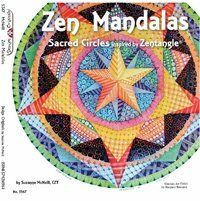 After holding our collective breath for so long, the three new Zentangle® books I told you about recently – Zentangle for Kidz , Zen Mandalas , and Zentangle 5 – are FINALLY available on Amazon for pre-order and they will ship very soon. And a surprise for those of you who loved calligrapher Joanne Fink’s videos, there’s more great news. Joanne too has a brand new book, Zenspirations , that’s also just been released. All four were published by Suzanne McNeill’s company. They’re sure to be chock full of information presented in a clear, whimsical style as Suzanne’s books always are and guaranteed be great additions to your art library. So click on the pictures or follow the links below and order your copies – don’t delay! As soon as mine arrive I’ll be adding my reviews. I’m SO excited to see them, from what I’ve been told by a little insider birdie all four are brimming with goodness and new things to try. Zentangle 5 by CZT® Suzanne McNeill with contributions from CZTs. 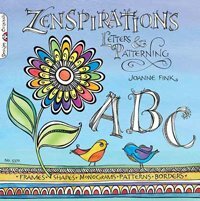 Zenspirations by Joanne Fink, 52 pages. These will ship VERY soon, so go ahead and place your order so you’ll be among the first to receive the new books. And in case you didn’t already know this, Amazon has a Pre-order Price Guarantee. “Order now and if the Amazon.com price decreases between your order time and the end of the day of the release date, you’ll receive the lowest price. Here’s how (restrictions apply)”. As always, I invite you to come back and let everyone know what you think of the new books by leaving a comment on their review pages. 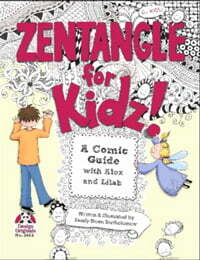 3 comments to The new Zentangle books are here! Can’t wait until they arrive. Thanks for the heads-up. Oeoeoeoe …. how delicious Linda !! 🙂 Look forward to them arriving on the market ! !